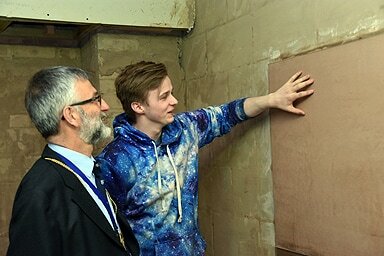 On 9th June students from City of Glasgow College, Kelvin College and South Lanarkshire College met in Kelvin College to compete in this year’s Bricklaying and Plastering Competitions. Two City of Glasgow students and three South Lanarkshire students were in the Plastering Competition. The aim was to render a rough wall with two coats of plaster to tight dimensions. It took most of the day to level the wall, set out the area to be plastered, mount the borders and then to plaster and finish the wall to a highly smooth standard. All the competitors did a marvellous job and enjoyed seeing another college and how they matched up against the opposition. The competition was marked by Phil Inglis of City of Glasgow College and Lewis Anderson of South Lanarkshire College. Both judges were most impressed by the accuracy and quality of work by all the students. Sadly there can only be one winner and that was Declan Collins of South Lanarkshire College. Collector Gordon Weech and Bricklaying winner Matthew Callaghan of South Lanarkshire College. The Bricklaying competition took somewhat longer than the Plastering competition and all the students had their heads down for the full duration of the competition. Like the Plastering competition, the Bricklaying competition was designed to stretch the students’ ability and also to work to a tight timeline. All of the students presented a finished wall to be proud of. The Judges for this competition were John Weir of City of Glasgow College, Jim Weir a retired Senior Lecturer from Kelvin College and Ian MacPherson of CITB. Once again the judges found that many of the students’ marks were very close, but the final winner was Matthew Callaghan from South Lanarkshire College. The Incorporation would like to express their thanks and gratitude to the three colleges for organising and judging these competitions especially when staff is so busy working exceptionally hard to ensure the success of as many students as possible. Special thanks go to David McLaren of South Lanarkshire College who co-ordinated the arrangements, to Allan Sinclair from Kelvin College for arranging the accommodation and materials and to John Brown for his untiring assistance. Without the help of the above and lecturing and support staff the Incorporation would not be able to enjoy supporting the students, staff and colleges. Lastly, a special mention must be made of the students; they had all volunteered to take part in the competitions to increase their skills. The winners of the competitions will be attending the Deacon’s Choosing Dinner with a partner of their choice as guests of the Incorporation of Masons where they will both receive a cheque to the value of £100, a certificate, a golden medal and the praise and acclimation of those lucky enough to be at the Dinner.